Do you want to build on you own an amplifier? Or do you want to build your crossover for an active system? PA6CC is a very powerful bipolar amplifier of classical design working in class AB with moderate power consumption. PA6CC consists of a differential cascode coupled input stage controlled by a current generator. The input stage is totally discret to optimize for linearity and bandwidth. The voltage gain stage is also cascode coupled, which is differentially symmetric in class A, to achieve low distortion at high frequencies. The output stage is of high current gain being an easy load to the voltage gain stage. The output stage consists of 12 pieces totally complimentary high speed high power bipolar transistors. PA6CC are decoupled at positive and negative supply with 2.2uF polypropylene capacitors. PA6CC has short circuit protection, thermal protection and rail fuses to prevent output device break down. PA6CC features sonic excellence, constant low output impedance, low noise, low distortion and high reliability. The maximum power output depends on voltage supply, heat sink and load conditions. 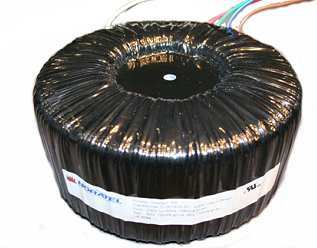 Recommendations: Voltage supply of +/- 85V, heat sink less than 0,1 K / W and minimum load of 2 Ohm. PSU4SA is a complete power supply unit with a lot of features. It provides power for DCN 23 and a number of PA 1CC or PA 3CC or other high quality amplifier modules. PSU4SA has separate linear regulated voltages of 3.3V, 5V and +/-15V to supply the DCN23. An input sensing circuit keeps an eye on signal inputs at DCN23 to auto start the power amplifiers. A switch selects between ON - STAND BY - AUTO SENSING to make ease of use in daily life. If on or signal is present this switches the transformer relay on. The transformer ramps up the 4 pieces low ESR capacitor bank by soft start circuit limiting inrush current to about 7A. When ready the power amplifiers are unmute by pulldown to GND. There are two LED's to indicate STAND BY or ON. PSU4SA will insure enough resources for the power amplifier modules to easily drive even difficult speaker impedances. PSU12SA is a complete power supply unit with a lot of features. 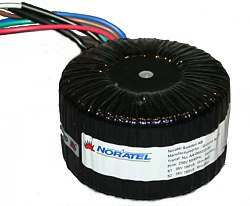 It provides power for DCN23 and a number of PA3CC or PA6CC or other high quality amplifier modules. PSU12SA has separate linear regulated voltages of 3.3V, 5V and +/-15V to supply the DCN23. An input sensing circuit keeps an eye on signal inputs at DCN23 to auto start the power amplifiers. A switch selects between ON - STAND BY - AUTO SENSING to make ease of use in daily life. If on or signal is present this switches the transformer relay on. The transformer ramps up the 12 pieces low ESR capacitor bank by soft start circuit limiting inrush current to about 7A. When ready the power amplifiers are unmute by pulldown to GND. There are two LED's to indicate STAND BY or ON. 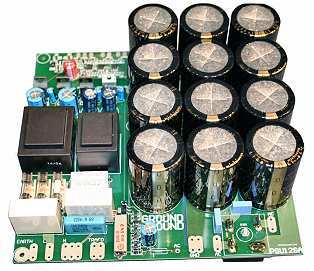 PSU12SA will insure enough resources for the power amplifier modules to easily drive even difficult speaker impedances. PSU DCN incl. 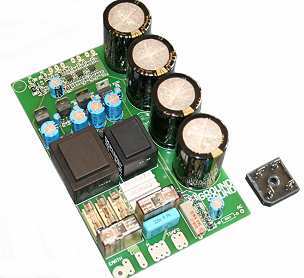 Relay board PSU DCN is a power supply unit intended to supply 1 DCN23. PSU DCN features a mains filter to suppress noise generated on the main line 230Vac to avoid unwanted noise output of the DCN23. Another feature is the relay board. If the DCN23 are used as a standalone filter, the relay board should be placed between DCN23 and the amplifiers to avoid power on and power off generated noise. 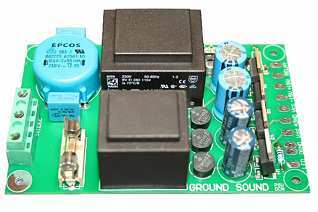 The relay board has delay unmute and rapid mute function. 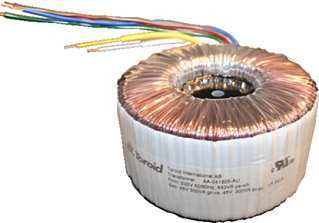 The output of the relay board is "pseudo-balanced" to enhance noise suppression on long cables. Notice that a normal 2- or 3-way stereo setup demands 2 DCN23 and 2 PSU DCN, one of each per channel. Our philosophy is to place crossover and amplifiers as close as possible to the loudspeaker to avoid long loudspeaker cables. This is possible due to the mono design of DCN23 and PSU DCN.